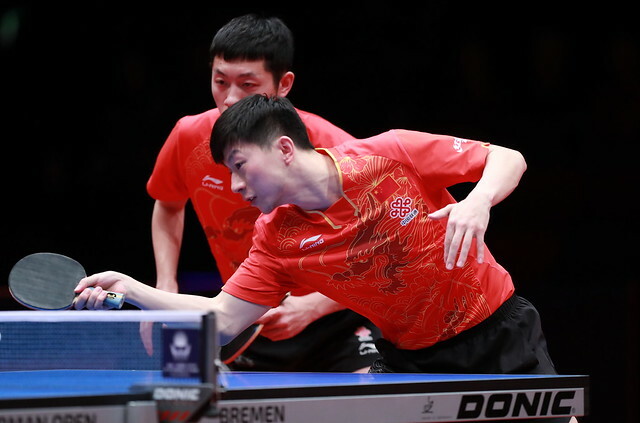 Crowned World champions in Rotterdam in 2011, Ma Long and Xu Xin won the Men’s Doubles title at the Seamaster 2018 ITTF World Tour German Open in Bremen on the late afternoon of Sunday 25th March. The no.5 seeds, at the final hurdle they overcame Korea’s Jeoung Youngsik and Lee Sangsu, the no.7 seeds and defending champions (11-7, 11-8, 11-9) to arrest the title. Some eight days earlier at the 2018 ITTF Challenge Polish Open in Spala, Jeoung Youngsik and Lee Sangsu had won the Men’s Doubles title beating Hong Kong’s Jiang Tianyi and Lam Siu Hang in the final. They had won in three straight games (12-10, 11-6, 11-8). Facing Ma Long and Xu Xin was a very different proposition; arguably they are best pairing of the current era and any arguably the best pairing of any era. At every opportunity they unleashed their favoured forehands; there may be some more difficult tasks in life than nullifying the sequence of hammer blows from the Chinese duo, I just can’t think of any. Ma Long and Xu Xin captured the opening game; in the second game the Koreans had a sniff of a chance, trailing 4-7, they levelled at 8-all but that was the end of progress. Ma Long and Xu Xin continually won the key points against a duo who never wilted and stuck magnificently to their task. On no occasion was the overall scenario greatly illustrated than in the point that brought matters to a conclusion. Ma Long and Xu Xin won when crisis loomed, Jeoung Youngsik and Lee Sangsu fought magnificently; Ma Long and Xu Xin led 10-7, Jeoung Youngsik and Lee Sangsu saved two match points before in a sensational rally, one of the very best of the whole tournament, Ma Long and Xu Xin prevailed; that one rally described the whole match. It was for Ma Long and Xu Xin their eighth ITTF World Tour Men’s Doubles final as a pairing, the record maintained, their eighth title but their first in Germany; for Jeoung Youngsik and Lee Sangsu it was their fifth ITTF World Tour Men’s Double final. Additional to last year in Magdeburg, in 2016 they had been runners up in Croatia, Slovenia and on home soil in Korea; in Bremen yet again silver medallists. A brave effort from the Koreans but the title belonged to China; a the curtain closed and the players departed the arena to the voice of Tina Turner who summed up the winners “simply the best, better than all the rest”, Ma Long and Xu Xin.